Here’s an interesting McDonald’s site. McDeezy is getting into APA Heritage Month. You can even learn some phrases in Cantonese, Mandarin, Tagalog, Japanese, and Korean here. Are you lovin’ it? This entry was posted in food, website on April 30, 2009 by Kevin Hsieh - channel APA. 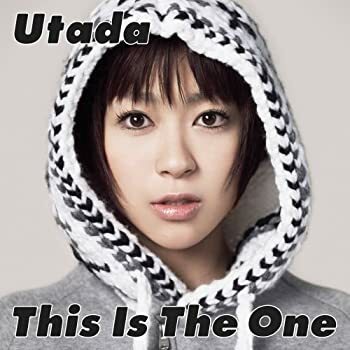 You can pickup her album “This Is The One” on or Amazon.com. This entry was posted in music on April 30, 2009 by Kevin Hsieh - channel APA. Lumina Wong (JuJu Chan) is beautiful but works far too much; although she lives in a city of millions, she still feels lonely and isolated. Late one night, Lumina has a chance encounter with Ryder Lee(Michael Chan), a handsome young man from another world that she can see in mirrors and darkened window reflections. She revels in the fantasy relationship until mirrorspy Eben Sanchez (Jacob Ziacan) comes into her life, warning her of the treacheries of the people of the Dark Realm. Soon Lumina must choose between the safety of the world she knows and the deadly allure of the unknown. We’ll let you know when the series is available online. This entry was posted in shorts on April 30, 2009 by Kevin Hsieh - channel APA. Los Angeles readers are you ready for the 2009 Los Angeles Asian Pacific Film Festival (it’s their silver anniversary!!) They proudly present Tze Chun’s CHILDREN OF INVENTION as the Opening Night film of the 25th anniversary edition of the Los Angeles Asian Film Festival on Thursday, April 30th, 2009 at 7:00 PM at the Directors Guild of America. Director/screenwriter Tze Chun, actors Michael Chen, Crystal Chiu, and Cindy Cheung, and other special guests are scheduled to attend the screening and answer questions from the audience. A reception in the DGA Grand Lobby will follow the screening. (BTW – you might be able to pickup a copy of the Children of Invention DVD after the screening. Can’t decide what else to watch, check out some of our recommendations here. This entry was posted in filmfestival, los angeles on April 30, 2009 by Kevin Hsieh - channel APA. For NPR’s “How Low Can You Go” family supper challenge, some of the nation’s best cooks have each agreed to come up with a budget-conscious meal for a family of four that’s healthy, easy and delicious. The hitch? The meal must cost less than $10 — and the cheaper the better. Chef Ming Tsai recently took the NPR challenge. He cooked a meal of chicken-and-corn fried rice on top of a spinach salad, because he says the variety of ingredients gives the dish a mix of temperatures and textures. The total for his dish $9.68. That’s less than $2.50 a person. 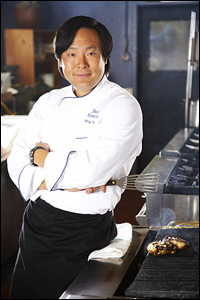 You can listen to Ming Tsai here. See the recipe below the video. Heat a wok or large saute pan over medium-high heat. Lightly coat with oil. When oil shimmers add chicken, season with salt and pepper, and brown, breaking up any large chunks with wooden spoon or spatula. Remove chicken to a plate. Add about 1/2-inch oil to wok and allow to heat; add eggs, which will puff up. Cook scrambled eggs and remove to a paper towel-lined plate. If necessary, add more oil to wok to lightly coat, then add onions and powdered ginger, and cook until nicely caramelized, about 5 minutes. Add corn, rice, chicken and egg, and toss to combine. Add naturally brewed soy sauce, toss to combine, and check for seasoning. Place mound of raw spinach in center of four dinner plates. Drizzle with lemon juice and season. Top with fried rice to cover. Enjoy! *Alternatively, if you’re not cooking rice the day before, place the cooked rice in a single layer on a sheet tray, and place in freezer to cool and dry. This entry was posted in food on April 30, 2009 by Kevin Hsieh - channel APA. As Quest Crew (winners America’s Best Dance Crew Season 3)was heading over to the meet & greet after the F.A.M.E Talent Show at SDSU last week, they got stuck the elevator at SDSU for around an hour. Getting trapped in an elevator got Quest Crew on TMZ. check it here. What’s more interesting than Quest stuck in an elevator is this Far East Movement and Quest Crew Collabo. BTW – Quest Crew and Beat Freaks are in New Jersey/NYC this weekend. (Don’t get stuck in another elevator. Far East Movement also have their own tour with Epik High called Map the Soul Tour. They will be hitting SF, LA, NY, and Seattle. This entry was posted in dance, music on April 29, 2009 by Kevin Hsieh - channel APA.